Spring is in the air, and we finally got a tiny reprieve from the insane amount of rain that swept through Texas. We recently moved our dining set off of our covered patio into the backyard by the pond, so we had a huge vacant space to fill with a patio set. We’ve wanted a sitting/conversation patio set for years, but hadn’t found one that had all we wanted. I wanted it to sit 5-7 people, Daniel said it must have ottomans, and Pee Wee needed a sofa all to himself. 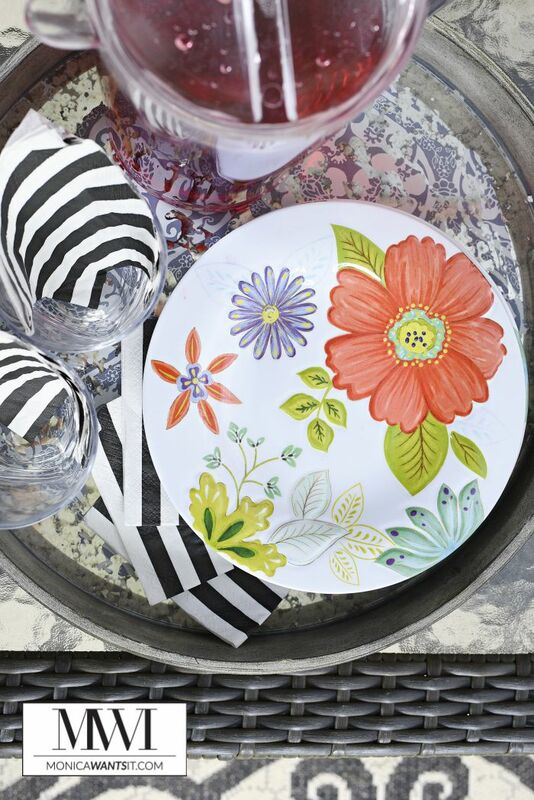 With spring here, and summer fast approaching, we wanted a set perfect for summer soirees. 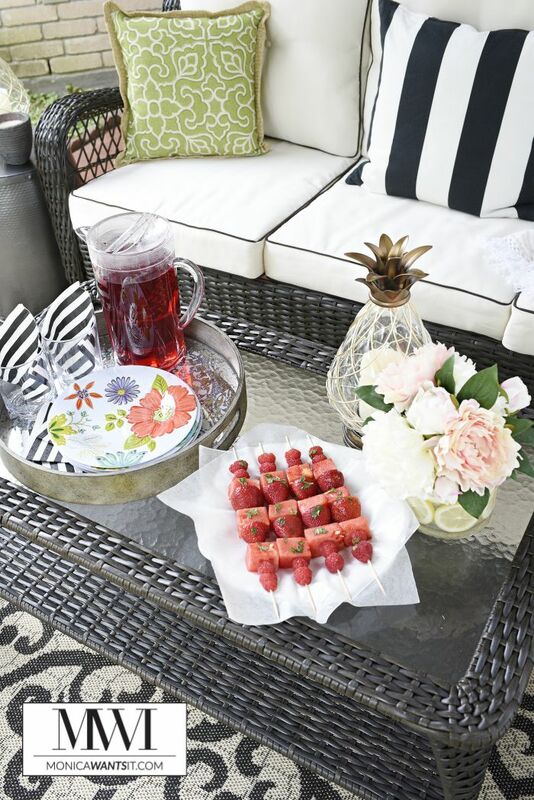 At the end of this post, I’ll share a sparkling tea and fruit skewers recipe, plus an easy DIY decor project. The Barcelona 6-Piece Seating Set from Big Lots was perfect for our needs. 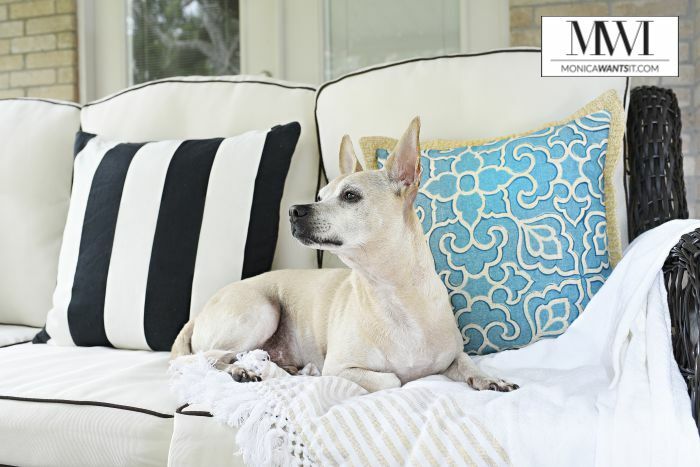 It has a high end look, spill proof fabric (which I accidentally tested the very day we brought it home…no stain! ), plenty of seating for 5-7, and the perfect value. 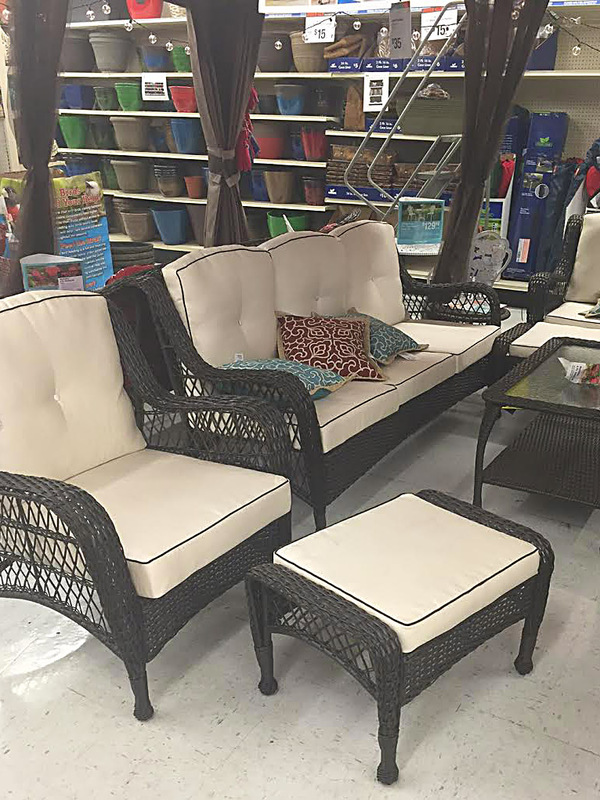 Big Lots has a variety of quality patio furniture to suit your outdoor/garden/patio needs including furniture, decor and gazebos! 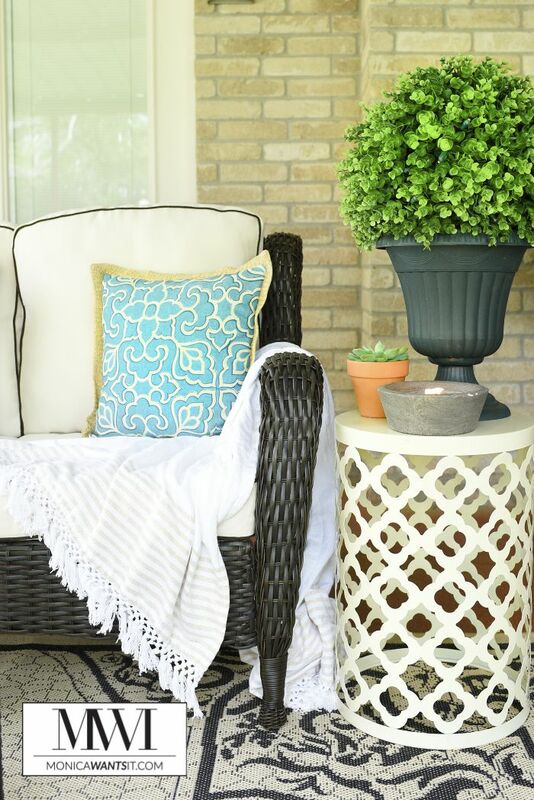 They’re trendy, affordable, and can be mixed and matched to create your own outdoor oasis, but the styles and assortment do vary by store. Our shopping experience was flawless, and I’d like to give a shout out to Carlos, Judy and Dora over at the Corpus Christi SPID location for their help. They were SO nice and even helped us load the two large boxes. The Big Lots we shopped at had the Barcelona set staged under a gazebo, which gave me even more ideas. It looked great in-store, but even better once we brought it home and assembled it (which took about 2 hours). The chair and ottoman are beyond comfy, and I took a nap on the sofa the first day we brought it home. I feel like I am on a vacation when I’m on my patio. Think of how it’ll function in your home: do you need to seat lots of people or just a few? Would a dining set be better than a seating set if you’re short on space? 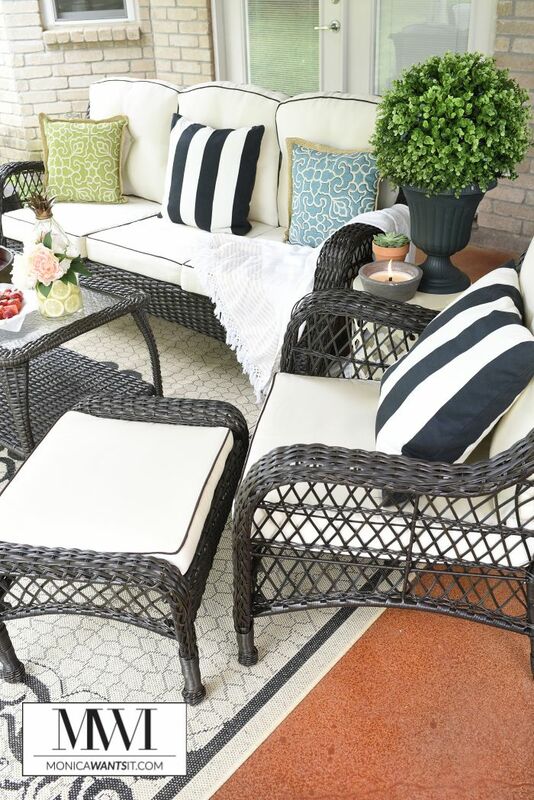 Maintenance & Utility: is the patio set easy enough to decorate with any color? Is the fabric easy to clean? Is it comfortable to lounge on or take a nap on? Scale: If you have a large area, you’ll need to get larger scale furniture or more pieces. What do you have? : If you already have some outdoor pieces, choose pieces that’ll complement them or contrast with them to add some interest. 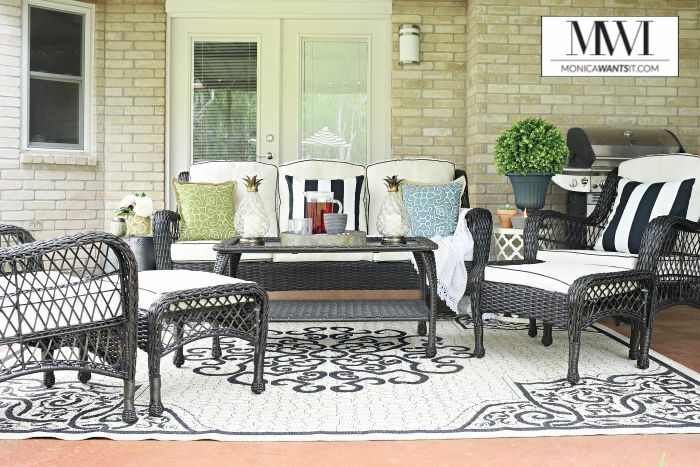 If you’re starting from scratch like we are, buy a patio set that includes all the seating and a coffee table to make the most of your purchase. 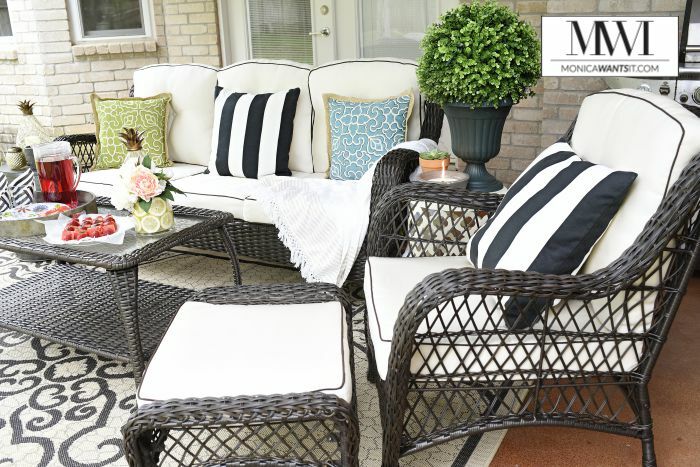 In addition to picking up this fabulous patio set, we also bought some accessories to tie this makeover together. 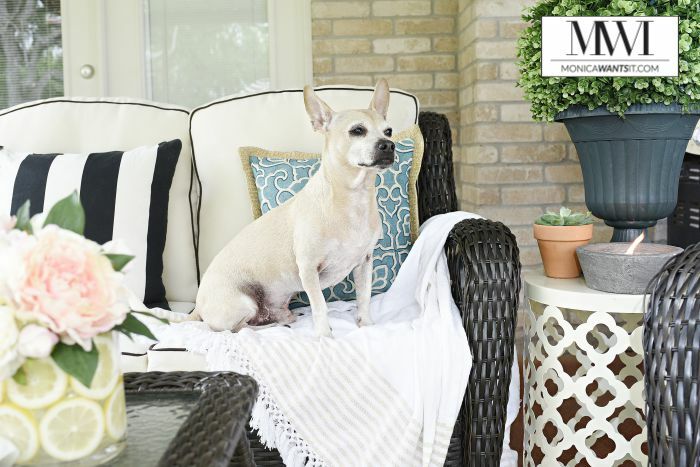 The perfect decor/accessories can make all the difference, so if your patio set feels a bit tired, pick up some decor pieces to make it feel new again. 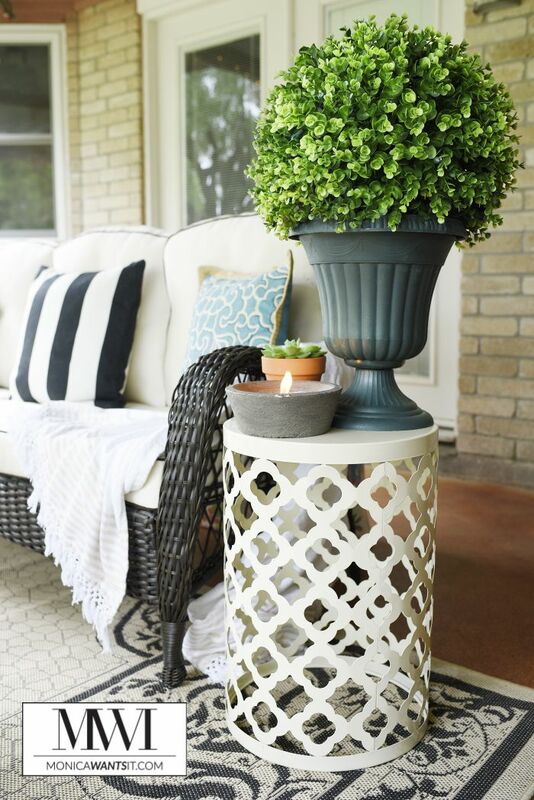 The side table, boxwood topiary (which lights up! ), and citronella candles add extra color and utility to our patio. 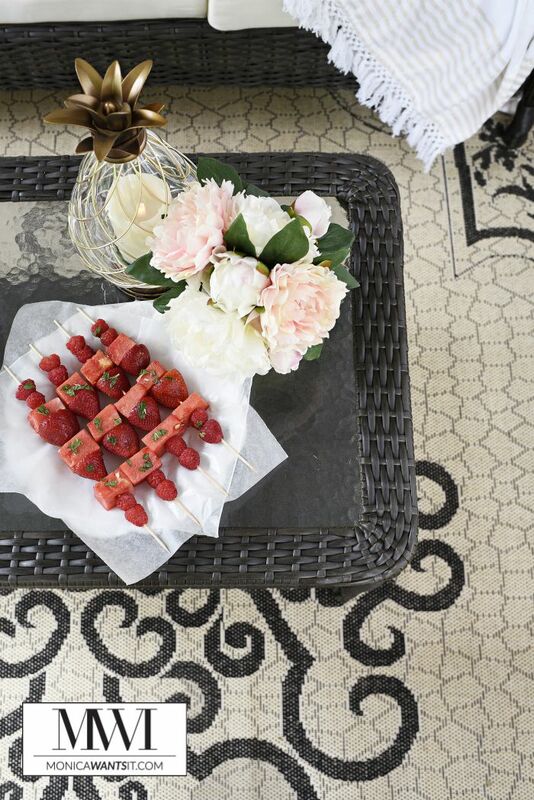 The quatrefoil design on the table fits right in to our decor style. I am OBSESSED with these battery operated pineapple flameless candles. They make any table look swanky, and the gold finish was made just for me, I’m positive. Since we’ll do lots of grilling and hosting friends and family, I picked up some melamine plates to add to our collection. These were a bargain and give a punch of color. The glasses next to the plate are also from Big Lots and they look like glass but aren’t…which is great for this klutzy gal. To anchor all of these furniture pieces together and define the space, I also picked out a beautiful neutral rug. The black flourishes are elegant, and the rug is easy to clean and comfy underfoot. Overall, we are absolutely in love with our new entertaining and lounging space. It’s like I have a whole extra living room. As usual, Pee Wee must make an appearance. He’s my sidekick in every single blog thing I do, true story. He gives the Barcelona set four paws up. 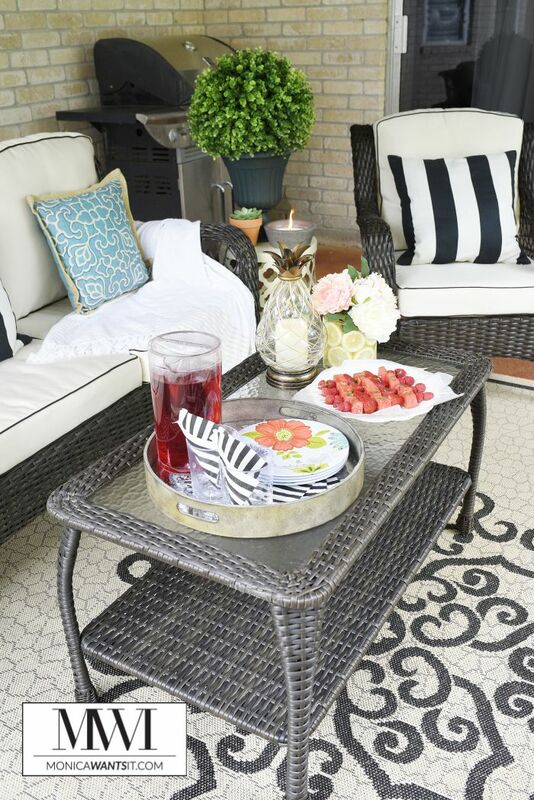 So, you have a patio set and all this room for entertaining, so what do you make for a party? If you’re having an outdoor party, fire up the grill! That’s Daniel’s role in our house, and we enjoy grilling chicken, veggies and kabobs. Today I’ll share two simple recipes that require no cooking, but pair beautifully with any main entree/dish. This tea is my modern take on an Arnold Palmer. 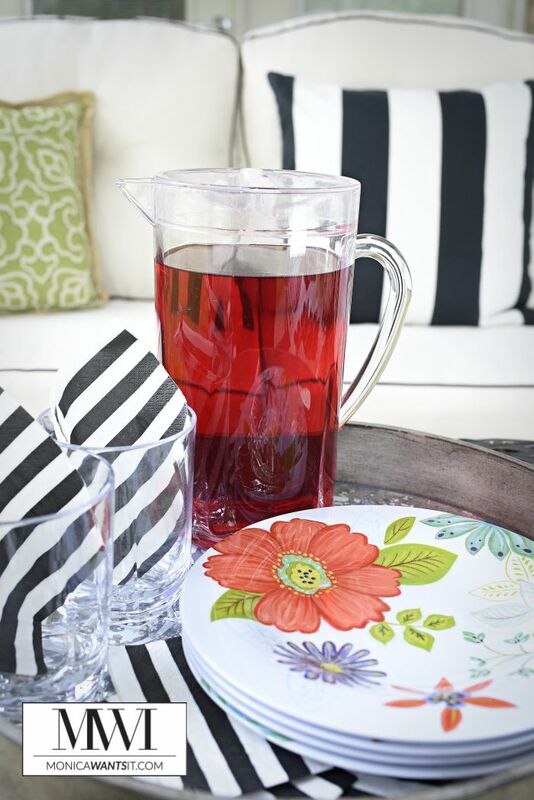 Using a hibiscus/berry herbal tea instead of black tea, plus lemon lime soda instead of lemonade, makes this a coffeehouse inspired sparkling tea that is refreshing and caffeine free. And, the color is so gorgeous! Directions: Steep tea bags in hot water for 5 minutes in a 1/2 gallon or 64 oz. pitcher. Discard tea bags. Pour in soda. Put in fridge 3-4 hours or serve over ice. Who doesn’t love the fresh, minty flavor of a mojito? 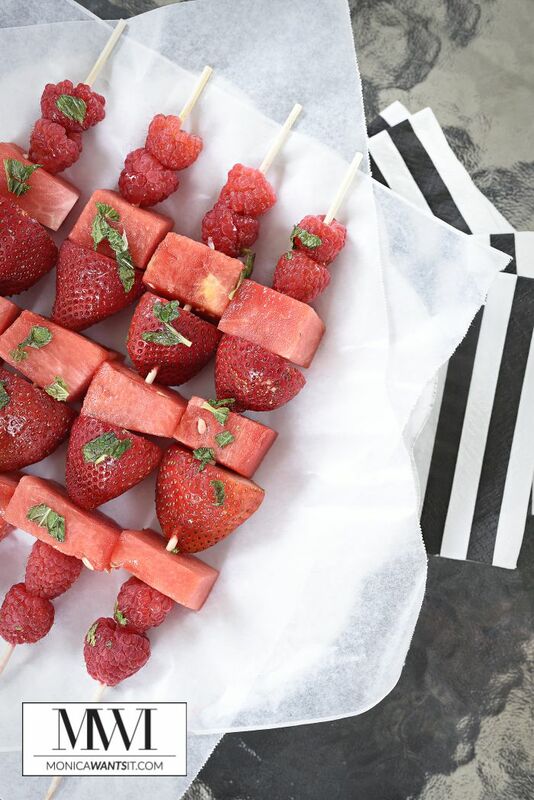 I ditched the alcohol but kept the lime and mint flavor profile to make these fruity, delicious, and refreshing fruit skewers. They look beautiful on a tray and are perfect for dessert– you can make these the night before to save yourself prep time. Directions: Wash and dry all fruit. 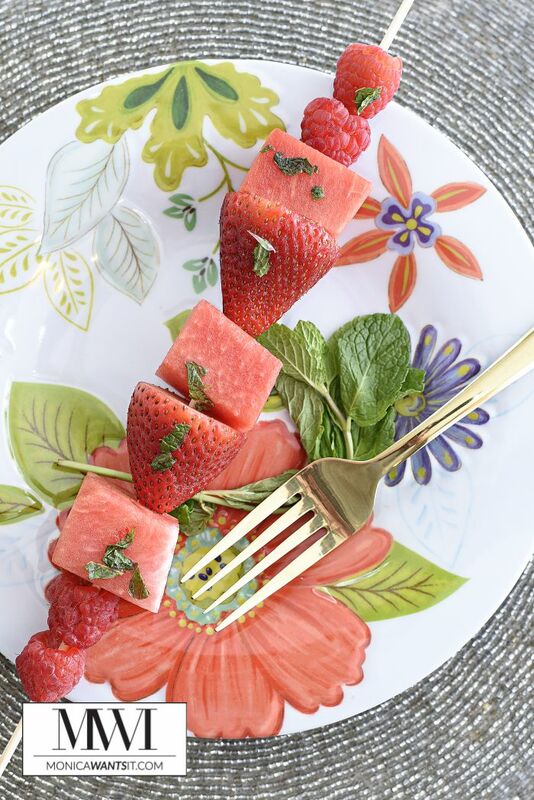 Cut off tops of strawberries and cube the watermelon. Slide on two raspberries, watermelon, strawberry, watermelon, strawberry, watermelon, and two more raspberries. Place skewers on cookie sheet in the fridge overnight. When ready for serving, finely chop the mint leaves and combine with the juice of two limes and powdered sugar or Splenda. Using a basting brush, glaze all the skewers with the lime/mint mixture. Chop up some extra mint to sprinkle on top as garnish. Enjoy! 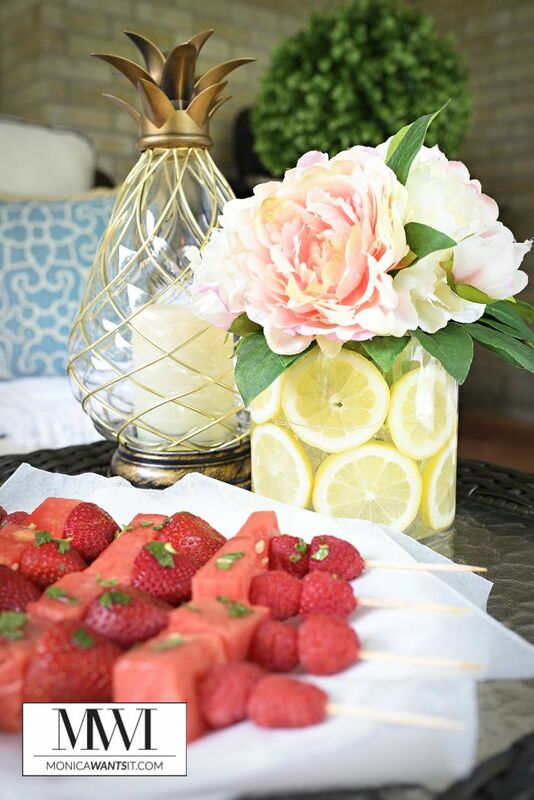 And finally, here’s a quick decor or centerpiece idea using lemons! All your guests will want to know how you made this, and it’s simple, I promise. Directions: Place the smaller vase into the center of the larger one. Slice lemons about 1/4″ in thickness. Place row of lemon slices on bottom followed by a stack on top. Fill center vase with water if using real flowers or rocks/gems if using faux flowers. This should help keep the center vase weighed down enough to not rise up when you add water to the vase holding the lemon slices in the next step. Carefully add water about 1/2 to 2/3 of the way to the lemons are almost fully submerged. Place your flowers in the center vase and marvel at your pretty centerpiece. The lemons will last in the vase for about 4-6 days. 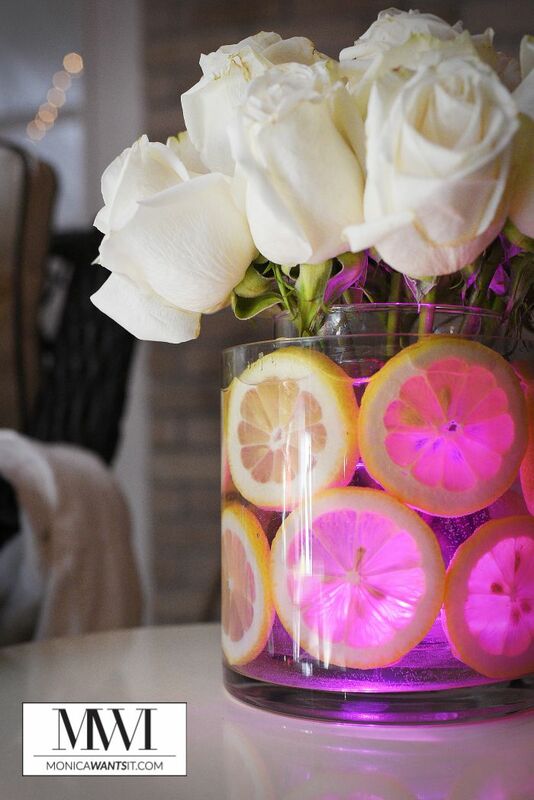 If you are hosting an evening soiree, I’d highly recommend tossing a couple of colorful submersible LED lights into the vase for a fun dash of color. 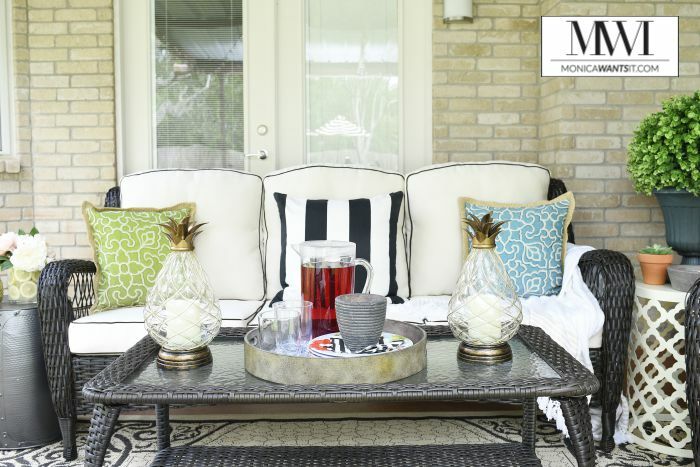 Here’s a look at the simple set-up so guests can have plenty of room to put their drinks and engage in lively conversation. 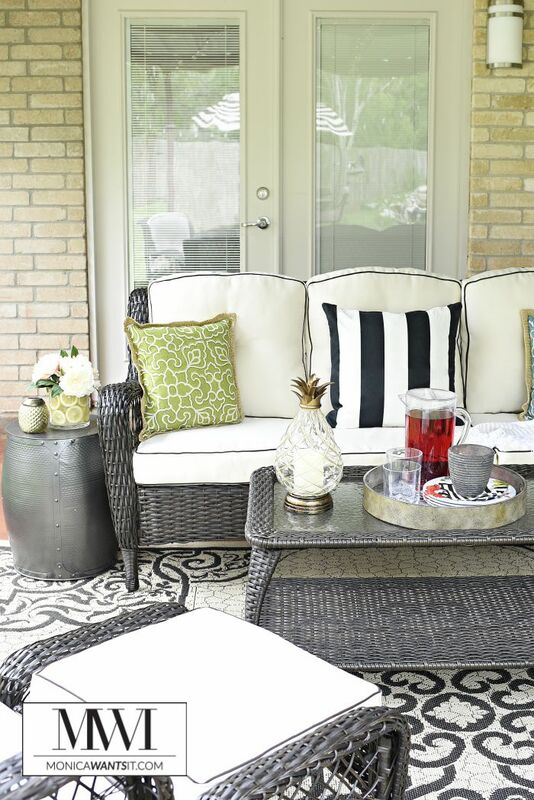 I hope my makeover and ideas helps you get in the mood for spring/summer entertaining and shopping at Big Lots! If you have any questions, drop them in the comments section. I’ll be back later this week with another HUGE reveal involving my living room. I cannot wait to show you all since I’ve had to keep the project under wraps for over a month. xo! Love this!!!! !You have a great backyard! love your sitting area. 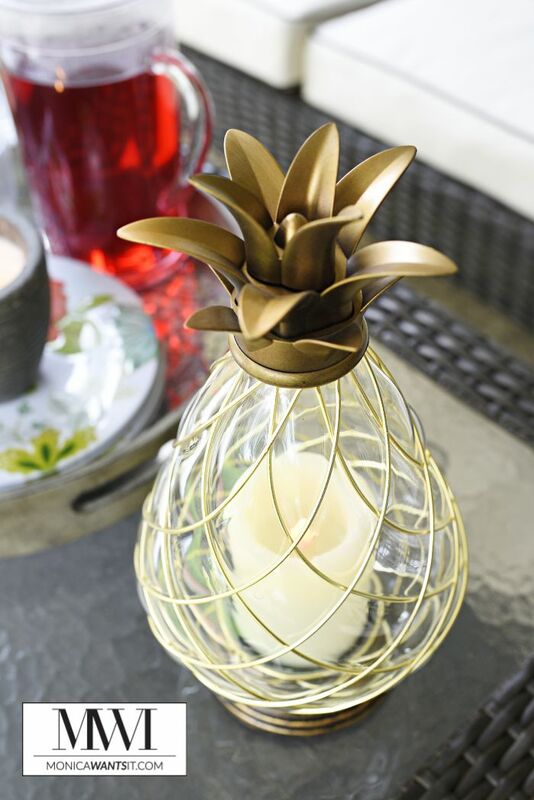 Did you get the pineapple candle holders at big lots too? Enjoy your new space! I've had my eye on that set, sure looks great on your patio!! You're so sweet, thanks Taina! Looks great. 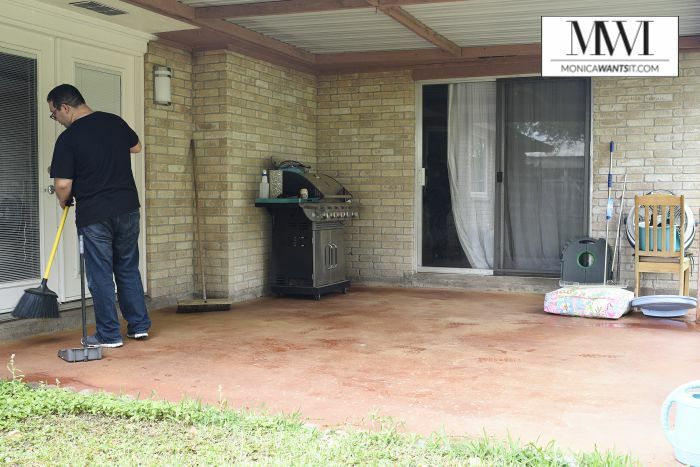 Love your new patio, such an inviting spot. Thanks so much, Marty! xo.